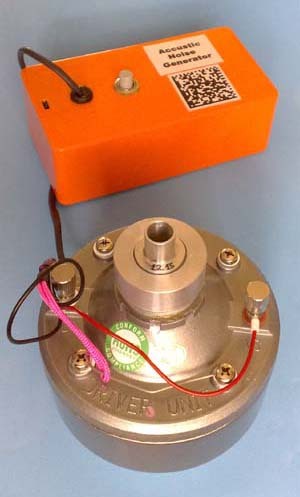 An acoustic noise generator is used to simulate the engine exhaust noise. 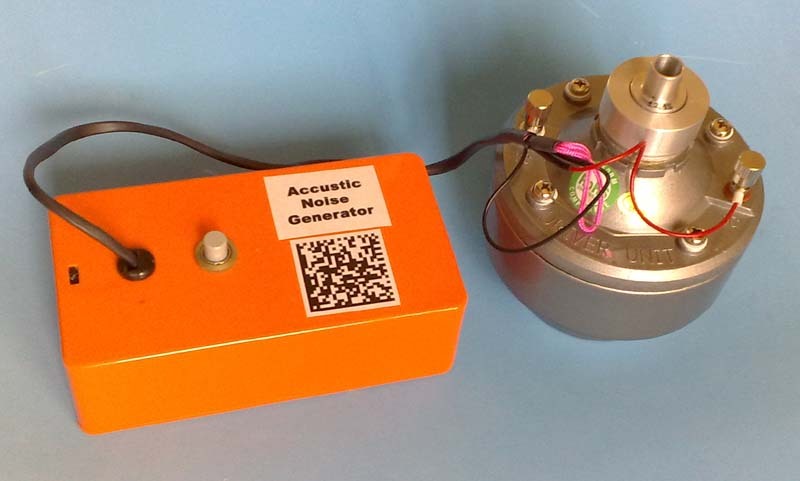 When the silencer is connected to this noise generator the effectiveness of the silencer can be measured with a sound meter. 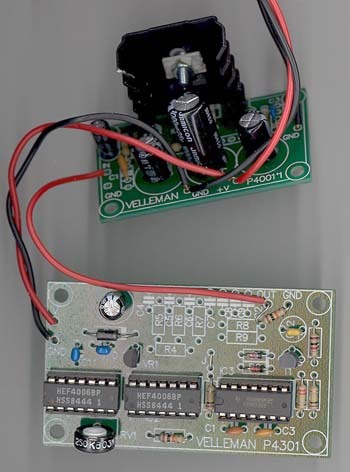 The noise generator is build from standard elements and can easily be made by pilots that have just a little experience with home built electronic circuits. Pilots do not need to have their own system and it would be ideal to build the system on a club basics. 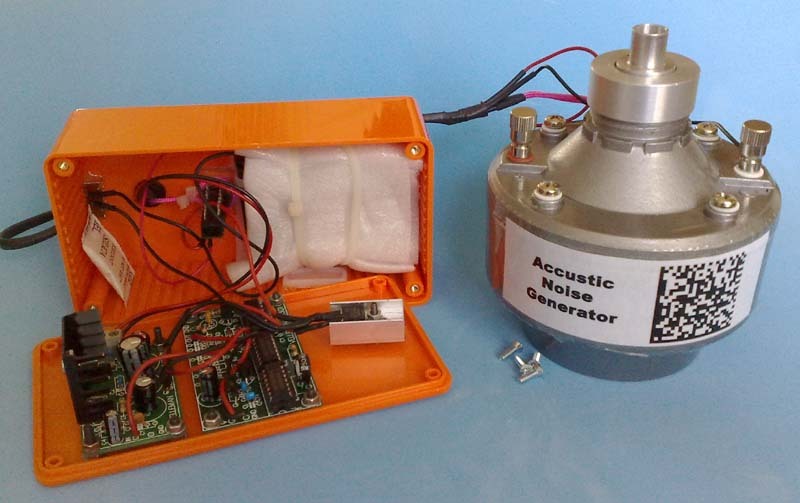 A complete noise generator can be made for less than 100 euro. The noise generator described here is of the same type as the F3D Pylon Race pilots used to check there silencer. F3D Pylon Race does also have problems with noise and have already used the acoustic noise generator like this for a year now. A good description of the method they use can be found here. Big thanks to Rob Metkemeijer for developing this system and for the help to adopt the system to F2D Combat. Pink noise generator: Welleman Kit: K4301, more info. 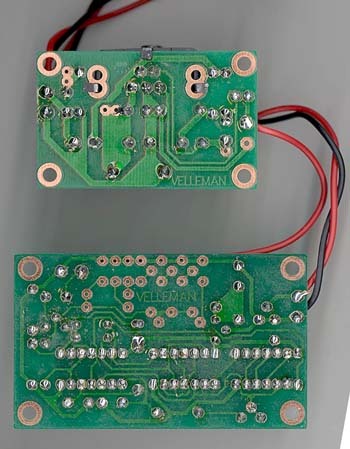 Audio amplifier: Welleman Kit: K4001, more info. More info on "Pink Noise"
The unit will only be activated for short periods and the power consumption is low so the system can easily be driven by a battery pack. I use 10 AAA alkaline batteries and a LM7812 voltage regulator to ensure a stable 12 V power supply. The loudspeaker used to generate the sound is a standard unit from the Italian company PASO. The price is around 45 euro. The quality of the loudspeaker is very important for the test. If the loudspeaker is not capable of delivering the correct sound pressure in the full tone spectrum the test will be biased by this flaw. Test results that relate to the equipment could be a problem in the future. To prevent this situation it is strongly recommended to use only the PASO SM 35 speaker unit for all test systems. 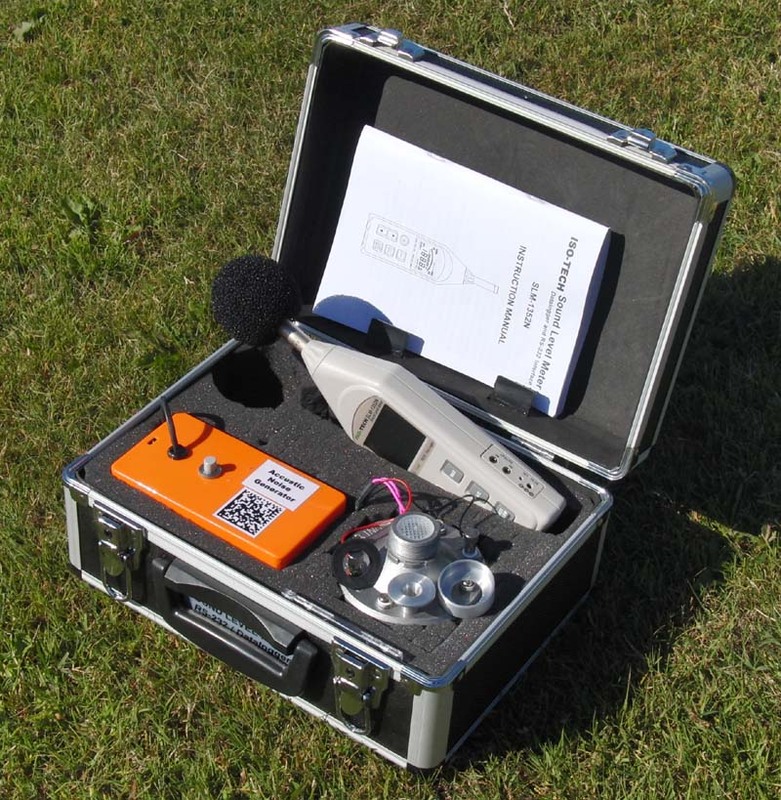 If pilots start to use different equipment for the noise a system for calibrating the systems must be set up. The equipment and resources for these calibrations will be much higher than what can be saved by using other speakers than the PASO SM 35. If somebody insists to use a different loudspeaker they must document that their loudspeaker is similar to the PASO SM 35. I.e. they must preform acoustic analyses on both the PASO SM 35 and the "alien" loudspeaker and document that the difference is too small to influence the test results. 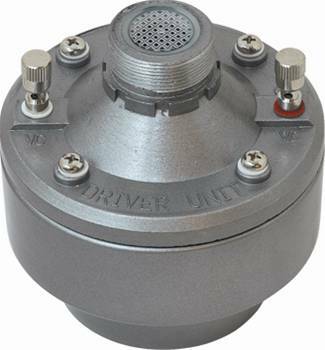 driver unit for horn speakers. The silencer must be mounted on the loudspeaker with an adapter. This adapter must have the same diameter as the exhaust pipe of the engine. 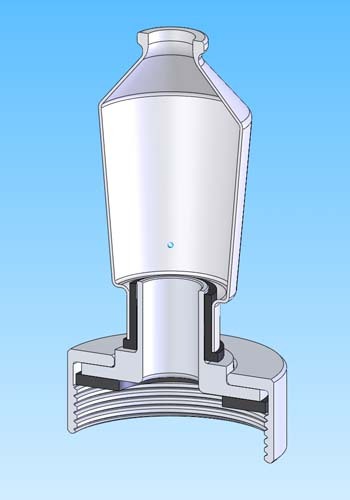 A series of adapters is needed to test silencers for different engines. The adapters are mounted on the loudspeaker with a threaded ring and sealed with a rubber disk.